Was there something wrong with the version of Ghost Rider we got on Season 4 of AGENTS OF S.H.I.E.L.D.? We actually saw both of them, when we found out that Robbie Reyes was "gifted" by Johnny Blaze. Yeah, we got a faceless cameo from Johnny, but Robbie was the Ghost Rider on Agents of S.H.I.E.L.D., and seems to remain so. I don't mind that at all; it preserves the Ghost Rider movies for those few of us who enjoyed them, while saving the masses who didn't from having to deal with all they didn't like. A Disney+ show featuring Robbie -- or possibly one with Man-Thing -- would be fine; as for Blade, I'd rather see him as a guest star before getting his own. Nice to see a little Mike Parobeck art. He really got a crappy deal when DC editorial buried his JSA series. He did some of the squarest jaws in an industry known for them. Nice one! It's always great to see the mighty DOCTOR MID-NITE. One of the most underrated characters in comic book history. @Wolfhammer: you mean, the Golden Age Charles McNider version? Or the Modern Age Pieter Cross version? 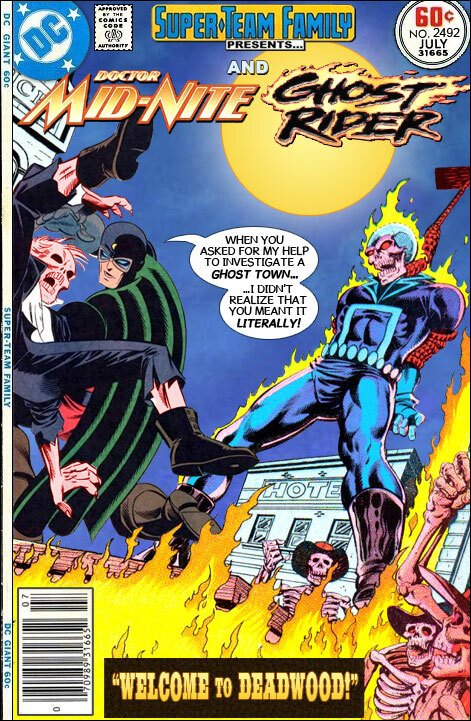 I would like to see a sequel to this using Danny Ketch as Ghost Rider and Pieter Cross as Dr. Mid-Nite. I got One More Silver Dollar! There aint no way to catch 'em no there aint no way to catch Doctor Mid-Nite & the Ghost Riiiider! I liked Mike Parobeck's art as well. It got the job done without being over busy like some art today with pages looking like they were designed to sell original art. With apologies to Iggy and Bowie.... calling Dr. Midnight! Calling Dr Midnight! Which one: Pieter Cross or Templeton Whatsername? @Cary Comic Templeton "The Face Man" Peck? @Brother Barnes: Nope! During the first year after the COIE (alias, the first year of the True Bronze Age), there was an African-American female Dr. Midnight. But, her full name was "Beth Chapel!" Chapel; temple. It's easy to see where his confusion arose.